Many countries have designated various day as celebrations of certain types of food and dishes. The United States probably has more food days than any other country in the world. For example, on August 24 every year many Americans treat themselves to delicious waffles in honor of National Waffle Day. 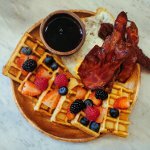 The first known waffle recipe dates back to the late 14th century. Although the recipe was found in a French anonymous manuscript named Le Ménagier de Paris (“The Parisian Household Cookbook”), Belgium was the first country where waffles became popular. Today Belgian-style waffles are famous all over the world. Waffles were brought to America by European immigrants. American waffles vary significantly from Brussels, Liege or Flemish waffles. They are thinner and denser than the Belgian waffle. American waffles are made with baking powder as a leavener, whereas Belgian waffles are leavened with egg whites or yeast. In America, waffles are a popular breakfast food. They can be served with butter, maple syrup, honey, powdered sugar, fruit and berries, ice cream, and even bacon. National Waffle Day in the United States is celebrated on August 24 because on this day in 1869, Cornelius Swarthout of Troy, New York received the patent for the first US waffle iron. The best way to celebrate this holiday is to cook some delicious waffles or go out for waffles if you don’t like to cook.